Environment Canada has issued a special weather statement for Hamilton Friday warning of potential icy conditions later this morning and afternoon. The agency says rain and patches of dense fog will continue to affect the area early this morning. The rain, however, is forecast to change to snow by midday as temperatures plummet with the passage of a cold front. Temperatures will drop as low as –2 C.
Environment Canada says there may also be a brief period of freezing rain during the changeover from rain to snow. “Surfaces such as highways, roads, walkways and parking lots could become icy and slippery. Extra care should be taken when walking or driving in affected areas,” said Environment Canada. 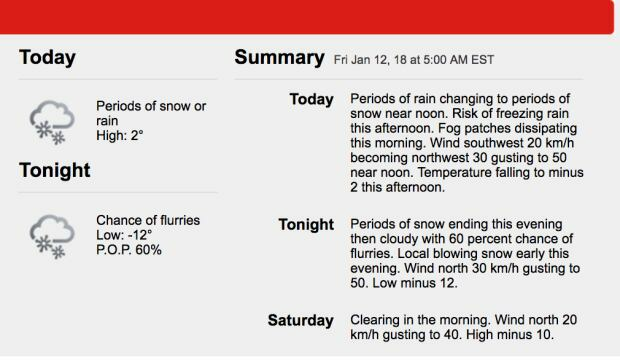 The agency says the snow is forecast to taper off behind the cold front, limiting snowfall amounts to a few centimetres at most. Friday: Periods of rain changing to snow near noon. Risk of freezing rain this afternoon. Temperatures falling to –2 C in the afternoon. Tonight: Low of –12 C. Periods of snow ending in the evening, then cloudy with a 60 per cent chance of flurries. Local blowing snow early in the evening. Saturday: Clearing skies in the morning. High –10 C.
Sunday: Sunny with a high of –12 C.
Monday: Chance of snow. High of –6 C.